A need to produce potable water for the residents of an island in the United Arab Emirates resulted in Invertek Drives Optidrive Eco variable frequency drive (VFD) being used as part of the reverse osmosis seawater desalination system. The system was needed at Al Fattan Island, a private development in the UAE, where no mains water was available. Using seawater and purifying it was the only option. GI.Tech FZE, Invertek’s sales distributor in the region, worked with Gulf Water Treatment, a designer and manufacturer of desalination systems. Pumps are used in the desalination process to maintain a minimum 1,200psi high-pressure water on a semipermeable membrane in the reverse osmosis process to remove particles and bacteria from the water. Three pumps are used in the process, pumping 20,000 gallons of water a day. 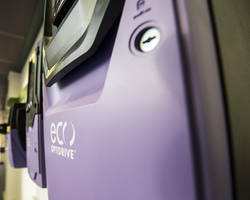 The Optidrive Eco IP55 was installed and commissioned as part of the solution controlling the 37kW pumps. “The desalination plant at Al Fattan Island is the only source of clean potable water,” said Soju Sonny Mathew of GI.Tech FZE. “So, it is essential for the system to have capable and reliable VFDs to control the high-pressure water pumps. “The water is pressurised at 70bar through the membrane which overcomes osmotic pressure, a colligative property. This process forms part of the desalination process, removing particles and bacteria from the water. Mr Harikrishnan K of Gulf Water Treatment, which was established in 1992 and has developed into a leading technology company with services and solutions for all aspects of water, from chemical treatment to hazardous industrial effluent, as well as seawater desalination, said Optidrive Eco was a perfect solution. “Our systems have to ensure accurate pressure as part of the reverse osmosis process. And so, to be able to accurately and efficiently control the pumps was crucial. The Optidrive Eco VFD maximises energy savings through constant monitoring of the pumps, optimising the output to match the required flow. Its advanced sleep and wake functions also provide maximum energy efficiencies by switching off the pump when it’s not required. The Eco can also detect pump blockages and can clean them automatically, thus reducing maintenance requirements. With Invertek’s built-in PLC function, the VFD can also be quickly and easily programmed and commissioned. Optidrive Eco can control AC Induction (IM) motors, AC Permanent Magnet (PM) motors, Brushless DC (BLDC) motors and Synchronous Reluctance (SynRM) motors. The range covers 200-600v single and three phase input and 0.75kW to 250kW, 1HP to 350HP. It comes in three enclosure options – IP20, IP55 and IP66 – and seven frame sizes, with OLED displays on IP55 and IP66 models. Invertek Drives Ltd is dedicated to the design and manufacturing of electronic variable frequency drives for controlling electric motors. The state-of-the-art UK headquarters, located at Welshpool, Powys, UK, houses specialist facilities for research and development, manufacturing and global marketing. All operations, including research and development, are accredited to the exacting customer focused ISO 9001:2008 quality standard whilst its Environmental Management System is accredited to the ISO 14001:2004 quality standard.